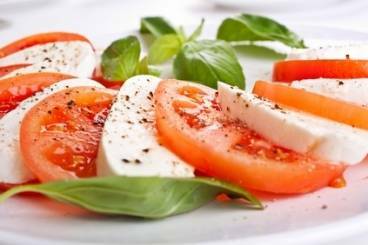 A simple salad of fresh tomato, basil and mozzarella dressed with olive oil, salt and pepper. Perfect as a starter or just as a snack served with more olive oil and good bread. Wash the tomatoes, remove the stalks and cut into slices. Wash the basil and pick the leaves from the stalks. Cut the mozzarella into slices. Arrange alternate slices of tomato and mozzarella on a plate. Season with salt and pepper and then drizzle olive oil over the dish. Garnish with basil leaves to serve.